Gregory V. Sullivan, a member of NEFAC's Board of Directors, spoke to the visiting group Jan. 15 at the Boston Foundation in Boston. The New England First Amendment Coalition recently presented to a delegation of Canadian public officials interested in learning about U.S. constitutional law and civil liberties. 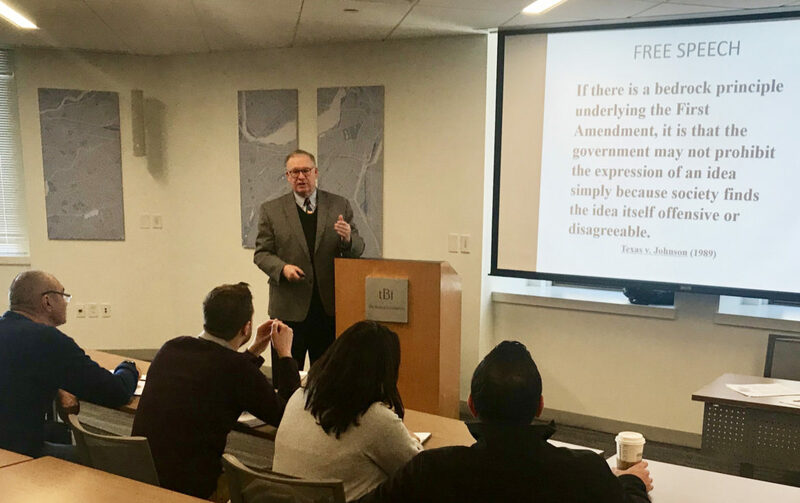 “It was a great opportunity to share with those outside our borders the value of the First Amendment and why it is so important to this country,” said Gregory V. Sullivan, a member of NEFAC’s Board of Directors who spoke to the visiting group Jan. 15 at the Boston Foundation in Boston. NEFAC partnered with WorldBoston, a non-profit organization that coordinates educational programming for international delegations. The coalition also presented to an Iraqi delegation in 2011. The presentation is the most recent speaking engagement for NEFAC which is increasing its educational programming throughout the region.